I contributed to the book economy on this one with a purchase a BN. And it was well worth the dineros! I had to take a break from the Star Wars EU after The New Jedi Order, Legacy Of The Force, and The Dark Nest Trilogy. Reading this was like meeting up with an old friend for lunch. This was my first Modesitt book (who is a very prolific writer). I really liked the exploration of society that this book took. Will there ever be a society like Haze? In infrared, white means very hot! Back in 1994, the world was lucky enough to capture one of the greatest fireworks shows in our solar system. Co-discovered by Eugene and Carolyn Shoemaker and David Levy, a comet that had been torn apart by Jupiter’s gravity hurled into the gas giant. Astronomers around the world had advance notice of the collision and hundreds of telescopes turned toward Jupiter to become a witness to raw power. Late last week, it happened again (see infrared pic above). However, we did not have advance notice. 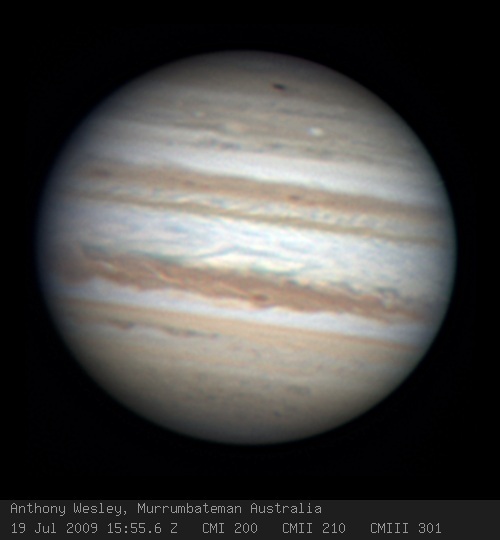 Amateur astronomer Anthony Wesley of Australia was admiring Jupiter when a dark spot suddenly appeared. After posting info about the spot on a message forum, scientists in charge of the large telescopes around world also began gathering data. The result, something huge had indeed crashed into the largest planet in our solar system. Here is the picture that Mr. Wesley captured as he was notifying the world of Jupiter’s new blemish. All I have to say is that we need to get our stuff together here on the blue marble. This could have been us. 😦 Support NEO detection! Support space exploration! Go NASA! A well put together collection of some great stories. Top two for me were: Neil Gaiman’s Orange and Cory Doctorow’s Anda’s Game (which has been adapted to a comic for free download). NASA kicked off it’s long awaited plans to return to the moon with the launch of LCROSS and LRO. 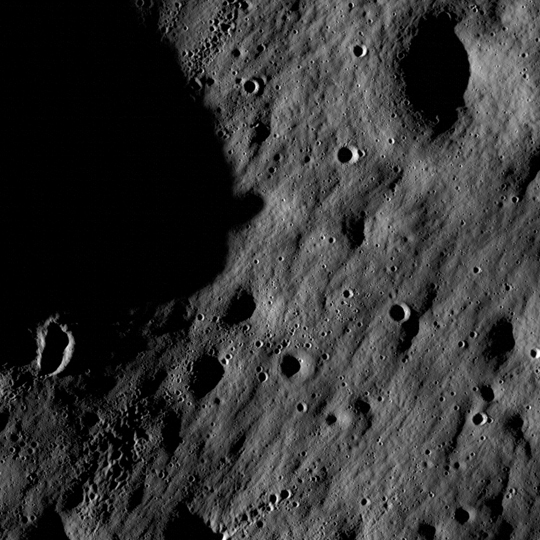 While LCROSS is doomed to crash into the moon and give us some insight into the possibility of water being found in the bottom of south pole craters, LRO is settling in for a 1-year mapping exercise. Yesterday, the LRO team shared the first pics from the orbiter. Awesome! I need to start saving up for my first visit for when they get the Lunar Westin ready. I call dibs on this plot of land! If I were a musician that had a lot of talent and about 10 years younger and didn’t have all the responsibilities of being a father & husband and had decided to not go into computer science and moved to Detroit and grew some dreads, then I would be Dwele! Do yo thang bruh!